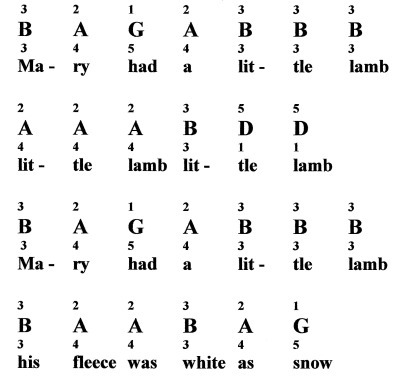 Because Mary Had A Little Lamb is a simple tune, it is a good first piece to learn and memorize. Learn it in all three keys to get started on learning the notes on the piano and your piano finger numbers. -play each line with right hand (fingerings written above note names) until it is easy and/or memorized. 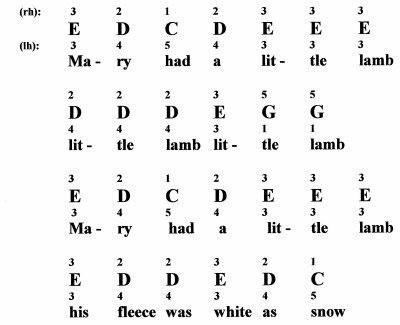 -play each line with left hand (fingerings written below note names) until it is easy and/or memorized. 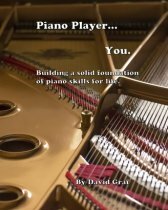 -play each line with both hands until it is easy and/or memorized. -string the lines together until you can play the whole piece. Keep it slow until you are comfortable and familiar with it. Then, start playing it faster, working up to an appropriate tempo for that piece. -Regardless of tempo, relax your arms & shoulders and keep it smooth and flowing. 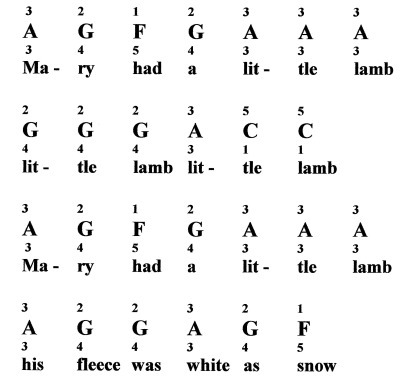 More Information on "Mary Had A Little Lamb"
For more about this tune, click here. return from "Mary Had A Little Lamb" to "Free Piano Lessons"